Why drive when you can walk! In five minutes, you can be anywhere on campus--classes, the dining hall, gym, library, computer labs, bookstore, friends, and campus offices like the Registrar, Financial Aid, and Academic Advising. There is a real disconnection for students who live off campus. Easy access to friends, faculty, and staff is hindered. Participation in groups, activities, games, and events is less likely for off campus students. There are many opportunities to live close to friends and get involved in leadership activities while living on campus. At first glance, living off-campus often seems like a good option. All the costs have to be considered-like rent, deposits, water, electric, cable, internet, phone service, furniture, food, etc. This does not take into account the time involved in driving, gas, purchasing food, etc. Is it really worth all the hassle and disconnection just to save a few dollars? Campus Police are on call and patrolling our campus 24/7, 365 days a year. They strive to protect our students. Every Residence Hall is staffed with Resident Advisors and a Complex Coordinator (professional staff member who lives on campus) who work to enforce our residential policies, geared toward keeping the halls safe. To continue the theme of safety, all halls are accessed through card access and physical keys for your bedrooms. Living on campus offers each student the emotional, social, and academic support to succeed as a student. Every hall is staffed with Resident Advisors trained by the Student Development Counseling Center. Faculty, staff, professional counselors and administration are available and close. Living on campus allows the student to know what is going on and be part of it. Learning about different types of people with various backgrounds can be an opportunity for the student to develop a more balanced world view. There is a feeling of family that cannot be duplicated off campus. Being part of a community you feel a sense of care and acceptance. 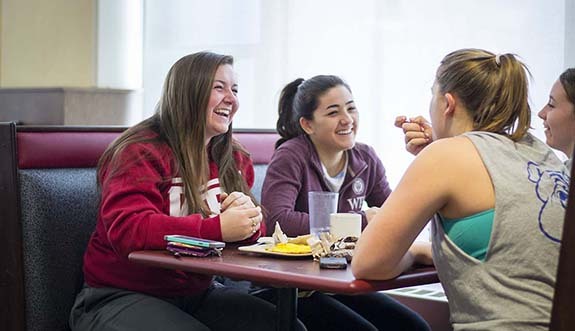 Living on campus offers a variety of amenities that come included. High Speed Internet and HD cable are included in your room. Your room comes fully furnished. There are laundry facilities provided in your building or close by. Maintenance requests with our facilities department are filled fast and accurately without having to wait for a landlord or finding your own help, at no cost to you. We want you to enjoy living on campus. Let’s face it. Isolation, on a regular basis, is not a healthy practice. We need each other and we need the resources that are offered in the campus environment. Experience the whole package of college life by living on campus. Enjoy your college experience. Make memories and friendships that may last long after you leave, take the opportunity while you can to enjoy the full college experience. Why the rush? You have the rest of your life to live off campus.